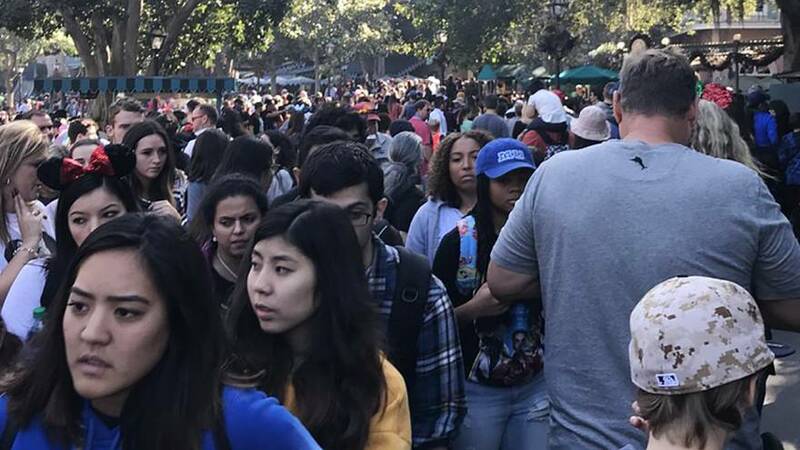 LOS ANGELES — A power outage at Disneyland in Southern California on Wednesday left some patrons stuck on rides, officials and parkgoers at the Anaheim attraction said. The outage at Fantasyland and Mickey's Toontown was reported at 11 a.m. local time (2 p.m. ET), according to NBC Los Angeles. The park's public relations department told the station that visitors were escorted off some rides. There were no injuries reported. About a dozen attractions were affected, a Disneyland spokesperson told NBC News. By noon most of the attractions were back online, the spokesperson said. The Disneyland spokesperson told NBC News that the outage was a result of "an issue with a transformer" but did not elaborate. People at the park posted pictures on social media complaining of overcrowding and of being stuck. "It's a huge disappointment. This is my mom's Christmas present to all of us. This has been in the making since August," Los Angeles resident Ashoka Thiagarajan, visiting with his wife and two children and who was stuck inside "Pirates of the Caribbean" for some 20 minutes, told Reuters. Disneyland's Twitter account said that the park was only accepting guests for re-entry. Earlier Wednesday it said that the park was very busy. "We have experienced a power outage near Mickey's Toontown and Fantasyland. We are working diligently to restore power to the affected areas as soon as possible," the park said on Twitter Wednesday afternoon. A spokesperson for Anaheim police and fire said the power outage at Disneyland was localized and not related to a city public utility, and that there were no calls for assistance from the departments. Disneyland said shortly before 4 p.m. that the power issue had been repaired and power was restored to all areas of the resort and it should be fully operational in 30 minutes. The park briefly lost power in August 2016 when an outage in Anaheim affected the park and some nearby hotels. In that case firefighters responded to people trapped in hotel elevators. Attendance at Disneyland in California in 2016 was more than 17.9 million, according to the industry trade group the Themed Entertainment Association.